One of the rarer Japanese Maples, Acer shirasawanum ‘Palmatifolium’ has very attractive large green foliage. Deeply lobed and each narrow and pointed withy a slight serration. Sometimes called the ‘Full Moon Maple’. Grown for the very attractive foliage from spring to summer, and then the long lasting and spectacular show of colour in autumn. New foliage is accompanied by bright red samaras (seed pods) which last well into summer. A good specimen of Acer shirasawanum Palmatifolium is one of the most attractive of all of the Japanese Maples, grown in good conditions it is an outstanding tree. Seen as more heat tolerant than many other Japanese Maples it is a wonder that this plant is not more widely grown. Look for Acer shirasawanum Palmatifolium ‘Aureum’. Wonderful bright golden yellow foliage in spring turning to a lime green to chartreuse in summer. Orange and red autumn tones. This variety is better in a shaded garden where the foliage adds a touch of brightness. Also known as the ‘Golden Full Moon Maple’. Acer shirasawanum ‘Autumn Moon’ has longer lobes and wonderful new foliage. 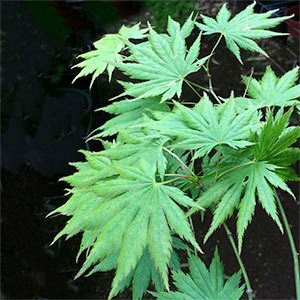 Acer shirasawanum Palmatifolium Summary Information. Height – Will reach 7 – 9 metres in height over time. Spread – This is an upright vase shapped tree with a crown of around 6 meters over time. Foliage – Mid green large palmate foliage with 11 lobes. Foliage turns to red, yellow and orange in autumn.